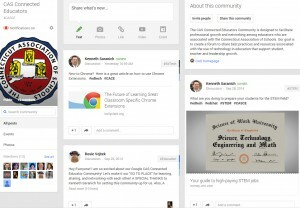 CAS has launched its very own Google+ community: the CAS Connected Educators Community (CASCE)! Through this new online forum, CAS hopes to provide an easy and accessible platform where educators can connect with one other and share best practices and resources associated with the use of technology in education. Online communities can be places of deeper learning and engagement; they can reduce isolation, provide immediate access to information and expertise, and facilitate the sharing of effective strategies and practices. Our goal in establishing the CASCE community is to build a rich personal learning network connecting educators around a shared interest in education and technology. Community members can identify popular topics and trends in educational technology, post news and ideas, and comment on other members’ posts. The more that is exchanged, the more the community grows as a place for expert information and practice. Please join our new community by visiting http://casci.ac/1065. You will need a Google+ account in order to become a member.